Black high top chucks are cool shoes. Back in my grade school days, I was a student at an all boys Catholic private school. We were required to wear uniforms for class and for gym. Class uniforms were jacket, shirt and tie, trousers and street shoes. Gym uniforms were white school t-shirts, navy shorts, white socks and white sneakers. Those students that were “out of uniform” could possibly be assigned a 500-word composition as a punishment, which was enough to keep me conforming. Because of the requirement and what I saw other guys wearing, I really hated wearing white sneakers. Black sneakers looked really cool on other guys from other schools and I really wanted to look cool just like them. Starting in 5th grade, I was allowed by my parents to get a pair of black sneakers for summertime wear and I really enjoyed that. 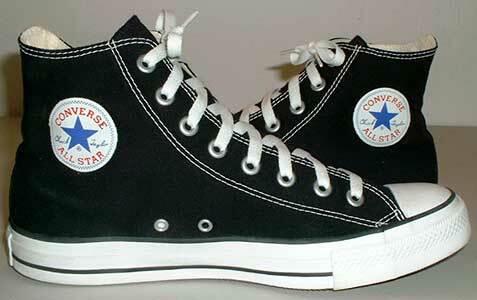 But then I was introduced to Converse All Stars on TV and in newspapers and magazines. I also actually saw them in a sporting goods store in a local shopping center and right then I knew the high blacks were the ones I just had to have. They definitely were the coolest! They were the ones worn by the Villanova Wildcats basketball team (my favorite) for home games and they looked unbelievably great. I finally got my first pair of high black chucks when I was in the 8th grade, which was either in late 1965 or early 1966. I purchased them in Brooks Sporting Goods in the Bazaar of All Nations in Clifton Heights, Pennsylvania. Brooks was subsequently acquired by Herman’s World of Sporting Goods, which you may recognize. Anyway, it was a Saturday afternoon and I was out shopping with my parents and as soon as we entered the Bazaar (which was a mall of sorts) I saw Brooks and displayed out front were Converse All Stars. I had wanted a pair badly for a couple of years already but I was really too shy to ask for them because I already had the white sneakers that I had to wear with my gym uniform. I couldn’t wait any longer. Now was the time to go for it! So we walked through the Bazaar and I formed my plan. Even though it was in the middle of the school year, I thought that I could ask for a new pair of sneakers to wear for the summer. Really, I could also wear these sneaks after school. So as we finished circling the Bazaar, I marshalled enough courage to ask my mother if I could get a new pair of sneakers for the summer. I said that I saw a pair in Brooks that I liked. She did not know anything about Converse and how cool they were considered. At the time, one of the things that concerned me was the price...$7.95, which was a lot of money to me back then. Panel from a 1960s box of Chuck Taylor All Stars. Brooks had a large display of Converse in dark brownish/maroon boxes and they were grouped by high black, low black, high white and low white. A salesman appeared and asked us if he could help. My mother said that I wanted a new pair of sneaks and he asked me what size (I was already staring at the collection of black Converse). I said size 11 (yes, I had big feet already back then) and he asked, “Black or white?” I said “black” (of course). “High or low?” I told him high and my mother was startled. High sneaks? Well, I just chose to leave that question unanswered and I took off my shoes to ge ready for my first Chuck Taylor experience. The salesman removed the right high black chuck from the box that said Mens Black All Star on the side. I thought...these were sneakers for a man! I noticed everything unique about the chucks...the distinct aroma, the black canvas trimmed in white stitching and rubber, the white ankle patch with the blue star and red lettering, the black heel patch with Converse All Star, Made in U.S.A. and Chuck’s signature, the dark brown sole, the white laces. The salesman started the lacing of the right shoe and handed it to me to try it on. WOW...it fit perfectly! Then, the left shoe. Fantastic! Another perfect fit! Yes, these were the ones I wanted, and these were the ones I got. I couldn’t wait to get home to lace them up with my best pair of white socks. When I got home, I immediately and proudly laced them up. Now I owned a pair of high black Converse! Just like all the other cool guys in America. The greatest sneakers ever manufactured. I wore them every day after school for shooting hoops in the backyard or for just knocking around. Boy, were my friends impressed! They, high black Converse Chuck Taylor All Stars, were the ONLY kind of sneakers I wore until my first year out of college. I have owned and cherished many pairs since that first special pair. Needless to say, they were my favorites then and still are my favorites.